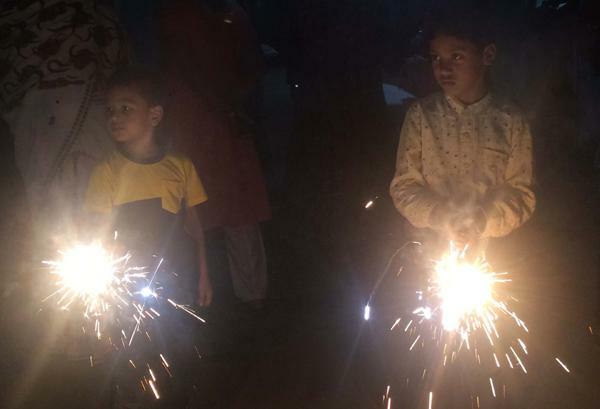 Earthen lamps dotted houses and lights decked up buildings as people celebrated Diwali amid some restrictions imposed by the Supreme Court on bursting of firecrackers. People visited their kith and kin, exchanged festive greetings and sweets while social media, including the likes of WhatsApp, Facebook and Twitter, was flooded with Diwali messages as many took the virtual route to convey their wishes. President Ram Nath Kovind has conveyed his greetings to the people, urging citizens to share the joy of the festival with the less privileged. He also asked the people to celebrate a pollution-free and safe festival of lights. "On the auspicious occasion of Deepawali, I extend warm greetings and good wishes to all my fellow citizens in India and around the world. "This festival is an opportunity to foster fraternity and unity among all citizens. Deepawali guides us from darkness towards light. On this occasion let us spread and share our happiness with those who are less fortunate than us," the president said in his Diwali message Tuesday. Prime Minister Narendra Modi, Defence Minister Nirmala Sitharaman and Army Chief General Bipin Rawat joined soldiers Wednesday on the occasion. Modi celebrated his Diwali with Army and ITBP personnel in the icy terrain near the India-China border, saying their devotion to duty in the remote icy heights is enabling the strength of the nation. "You are not only protecting one corner of our land. By securing the country's borders, you are making safe the lives and dreams of 125 crore Indians," Modi, dressed in heavy mountain gear, told the soldiers in the presence of Army Chief Rawat. Sitharaman celebrated the occasion with Army personnel in remote posts in Arunachal Pradesh near the Sino-India border. In a tweet, Congress president Rahul Gandhi, said, "My best wishes to all Indians, on the auspicious occasion of Diwali. I wish you all peace & happiness." The Border Security Force (BSF) and the Pakistani Rangers exchanged sweets and greetings on the festival of lights at the Attari-Wagah border in Punjab, officials said. The BSF gifted sweets to the Pakistani Rangers and it reciprocated the gesture. In the national capital, a thick haze engulfed the city Wednesday night with the air quality deteriorating to the "very poor" category as Delhiites continued to burst firecrackers long after the deadline set by the Supreme Court, the authorities said. Eyeing rising pollution levels in cities across the country, the Supreme Court last month said people can burst firecrackers from 8 PM to 10 PM only on Diwali and other festivals. The court had only allowed manufacture and sale of just the "green crackers" which have low emission of light, sound and harmful chemicals. The overall Air Quality Index (AQI) was recorded at 302 at 11 pm, which fell in the very poor category, according to the Central Pollution Control Board (CPCB). There were reports of its violation from many areas long after 10 pm, despite the Supreme Courts order and several areas showed a spike in the air pollution. To mark the festival of lights, the United Nations Wednesday issued special postal stamps to commemorate Diwali. The stamps were released by the UN Postal Administration. The sheet in the denomination of USD 1.15 contains ten stamps and tabs featuring festive lights and the symbolic lamps, diyas. The Golden Temple, the holiest Sikh shrine in Amritsar, was illuminated with a newly-installed special lighting system and traditional 'diyas'. It witnessed a huge rush of devotees who took a dip in its holy tank and offered prayers at the sanctum sanctorum and Akal Takht (highest Sikh temporal seat). Bollywood turned to Twitter to greet people on the occasion . "Greetings for a happy prosperous and successful Diwali ..," actor Amitabh Bachchan said. Director Karan Johar said, "Happy Diwali to all of you! Love and light for life.....stay as positive as you can this year." Greeting people on the occasion, actor Anushka Sharma in a tweet said, "Happy Diwali to all . Hope you all find the light in you . Be happy , be kind, be safe."